Heat oven to 350°F. Cook and drain pasta as directed on package, using minimum cook time. Meanwhile, in 10-inch skillet, cook sausage over medium-high heat 5 to 7 minutes, stirring occasionally, until no longer pink; drain. Stir in pasta sauce, ricotta cheese and cooked pasta; cook 1 minute. Separate dough into 8 biscuits; press each biscuit to 5 1/2-inch round. Firmly press rounds in bottoms and up sides of 8 ungreased jumbo muffin cups, forming 1/4-inch rim. 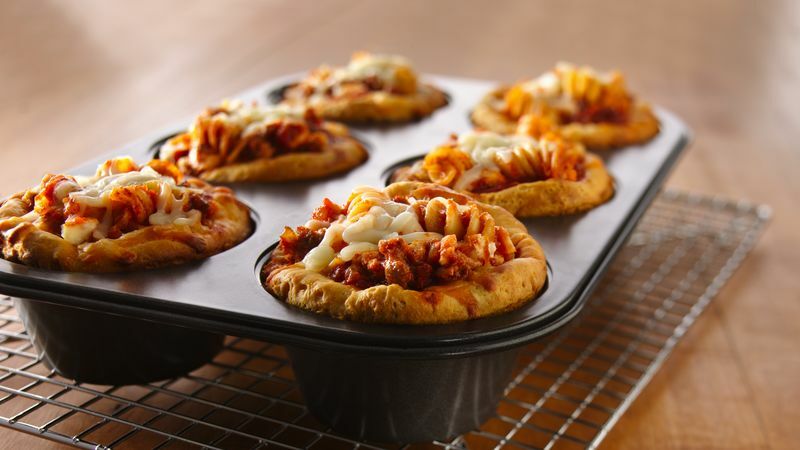 Fill cups with sausage mixture; sprinkle with mozzarella cheese. Bake 28 to 32 minutes or until golden brown. Cool 1 minute; remove from pan.